Commonly offered as prasad, Motichoor Ladoo is a favourite festive treat across India. Admit it, once you start having it, you cannot just hold back at one. Motichoor Ladoo or Motichur Ladoo is a round-shaped sweetmeat made from fine, tiny balls of besan. The chickpea flour globules is fried in ghee or oil, and soaked in sugar syrup. The sweet, pearl-like balls are then moulded into ladoos. Motichur Ladoo is originally said to hail from the Northern region of the country, but happens to be a favourite across the country and the world. The word ‘motichoor’ literally translates to crushed pearls and honestly we think their couldn’t have been a better name for the delicacy. Originally associated with states like Rajasthan and Uttar Pradesh, these ladoos were also easy to store in the torrid temperatures, and wouldn’t go bad for days. 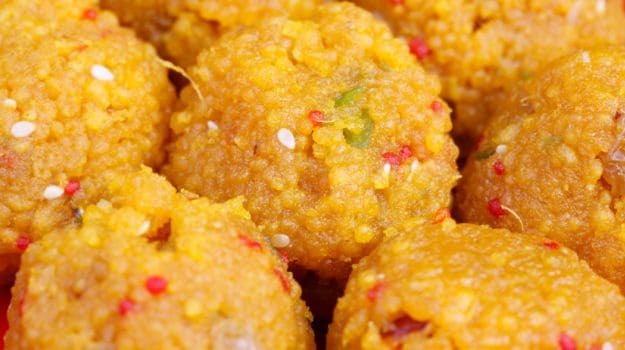 Motichoor Ladoo has also found its mention in ancient and medieval texts of South and Eastern regions. If we go further back in history, legends suggest that originally ladoos were invented for medicinal purpose by the father of Indian surgery and medicine Susruta. For instance, the Til ke Ladoo that we all relish today, Susruta in the 4th century B.C began using it as an antiseptic to treat his surgical patients, (the combination of sesame seeds, jaggery and peanuts was said to have immense nutritional properties). Somewhere down the line, ladoos came to being associated with all things festive, happy and yummy. Traditional ingredients to make ladoos were ghee, khoya and jaggery. A turning point for ladoos came with the introduction of sugar in the recipe, and later the mass cultivation of sugar across the country. On realising that adding sugar can take the sweet quotient multiple times higher, people began adding sugar in great quantity to lure the costumers. It is said that the traditional Boondi Ladoo, also paved way for Motichoor Laddoo as the popularity of sugar syrup caught on. Just like Boondi Laddoo, Motichoor Ladoo was also preferred for its extra shelf life, as they could be carried for long distances. It used to be and still is a very common habit of carrying Motichoor Laddoos in dabbas for long journey. 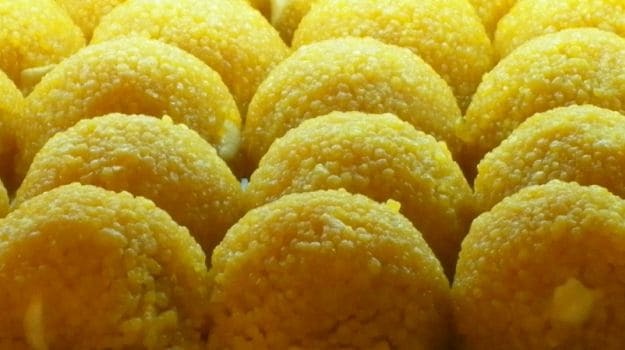 They were prepared in the same way as Boondi Ladoo, and slowly made its way as one of the most loved sweets in the country. Motichoor Ladoo has become an intrinsic part of every Indian festivity. With the season of festivals in the offing, we can’t wait to binge in on our share. Let us know your favourite Indian sweetmeat for all seasons.